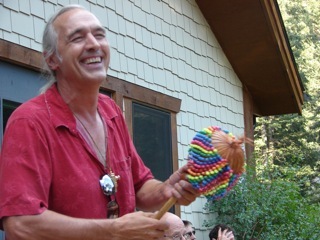 Gregg (hand-percussionist, drum circle facilitator, professional musician) has lived a lifetime of music. For over 35 years he has spread 'the word' far and wide across this country. Though he studied and played guitar professionally throughout the years, his interest turned to hand percussion in the mid-nineties. While 'suffering from' and 'in process of curing' a severe carpal tunnel injury, the djembe drum came into his life. Gregg's particular process of learning the traditional technique proved to aid significantly in pain reduction and ulitmately the cure. Many other benefits were and are still being discovered along the drumming path. 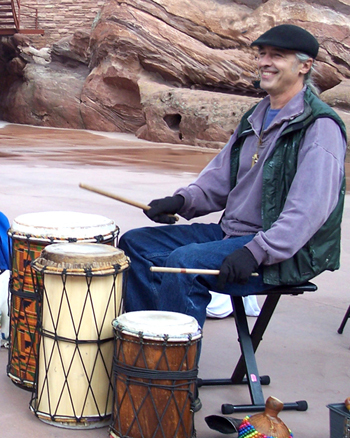 From all this, Gregg developed a method of learning djembe that is accessible to absolutely everyone and anyone, no matter what age or physical condition. His years of working in 'Arts in the Schools' programs lends to his teaching expertise, as his lifetime of performing aids in his ability to lead anyone into having a musical experience.